Amazing location in the City of Vista, Enjoy the 4th of July fireworks from the front yard and on a clear day get a view of the ocean. It is a Single Story 3 bedroom 2 bathroom, 1998 sq ft Home. Home sits on a large corner lot, surrounded by flowers and a mature orange tree. Front doors open to a tiled foyer and large formal living room/ dining room, the master bedroom sits off the front entrance away from the other bedrooms as its own retreat, offering a walk in closet and its own spacious bathroom, walkAmazing location in the City of Vista, Enjoy the 4th of July fireworks from the front yard and on a clear day get a view of the ocean. It is a Single Story 3 bedroom 2 bathroom, 1998 sq ft Home. 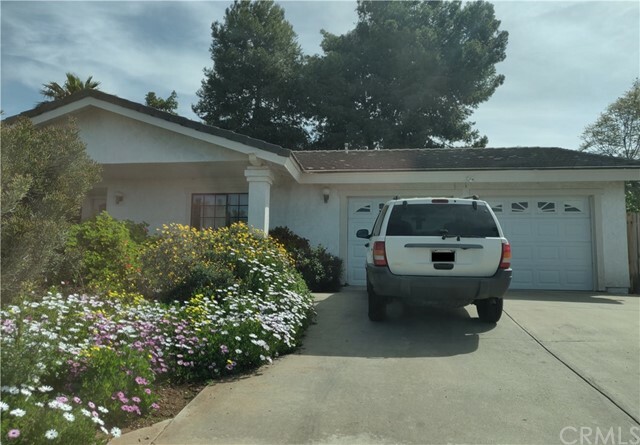 Home sits on a large corner lot, surrounded by flowers and a mature orange tree. Front doors open to a tiled foyer and large formal living room/ dining room, the master bedroom sits off the front entrance away from the other bedrooms as its own retreat, offering a walk in closet and its own spacious bathroom, walking past the formal living room and you will find a open kitchen to family room concept with beautiful dark vinyl wood flooring, kitchen has wooden breakfast nook and double doors that lead to side yard patio, a beautiful location to enjoy a morning cup of coffee. A hallway from the family room leads to the second and third full size carpeted bedrooms and a 2nd full bath and laundry room. Flooring and paint are approx 4 years old, The 2 car garage consists of 2 single garage doors offering plenty of room for full sized vehicles and storage. This single story home has a great floor plan and a little personal touch will go a long way in making this diamond shine. More photos coming soon.